K10: The largest of the new devices, the K10 has a 5.3-inch, 720p touch display that's covered by 2.5D curved glass. The phone boasts a metal frame and measures 7.9mm thick. The K10 is powered by a 1.5 GHz octa-core MediaTek processor with 2 GB of RAM and 16 GB of storage. It has a 13-megapixel main camera with a 5-megapixel user-facing camera. The K10 includes a fingerprint sensor, NFC, and the battery rates 2,800mAh. The phone will ship with Android 7 Nougat. K8: This slightly smaller handset has a 5-inch 720p screen and is powered by a 1.4 GHz quad-core Snapdragon 425 processor with 1.5 GB of RAM and 16 GB of storage. It has a 13-megapixel main camera with a 5-megpaixel user-facing camera and advanced camera functions. The K8 includes NFC and the battery rates 2,500mAh. The phone will ship with Android 7 Nougat. K4: Like the K8, the K4 has a 5-inch 720p screen. It is powered by a 1.1 GHz quad-core Snapdragon 210 processor with 1 GB of RAM and 8 GB of storage. It supports memory cards up to 64 GB. Both the front and rear cameras have 5-megapixel sensors, and the battery has a capacity of 2,500mAh. The K4 ships with Android 6 Marshmallow. K3: The smallest and least expensive of the bunch, the K3 has a 4.5-inch FWVGA display. It is powered by a 1.1 GHz quad-core Snapdragon 210 processor with 1 GB of RAM and 8 GB of storage. It supports memory cards up to 32 GB. The main camera has a 5-megapixel sensor and the front camera has a 2-megapixel camera. The K3 has a 2,100mAh battery and ships with Android 6 Marshmallow. LG said more details about the new K Series handsets, including pricing and availability, will be shared during next month's Consumer Electronics Show. 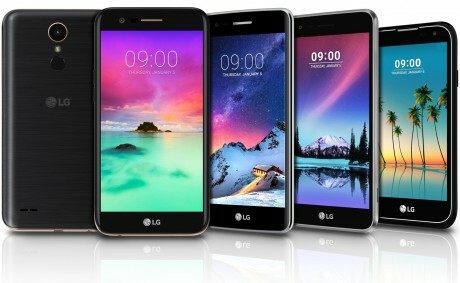 LG updated its K-series phones this week, refreshing its more affordable Android lineup with improved specs and features. The K10 — the new K10, that is — adds a fingerprint sensor and spruces up the design.